Another one of my brother’s specialties. This recipe makes enough for 6-8 people to have a hardy breakfast and it’s flexible enough to throw in just about whatever you want. Preparation: Cut potatoes into cubes. Slice peppers length-ways and then into thirds. Cut onion into chunks or slices. Cut sausage into small pieces/chunks. Scramble eggs in separate bowl with small amount of milk. Cook bacon until crispy and crumble into fairly small pieces. Cooking and Combining: Add oil to a large skillet with high sides and cook the potatoes and sausage together until browned but with the potatoes still firm. Add the peppers and onions to the main skillet while starting to cook the scrambled eggs in a separate skillet. Once the eggs are 90% done, add them to the main skillet and continue to cook until the peppers are at the desired firmness. Add the top layer of cheese, sprinkle the bacon on top and turn the heat off. 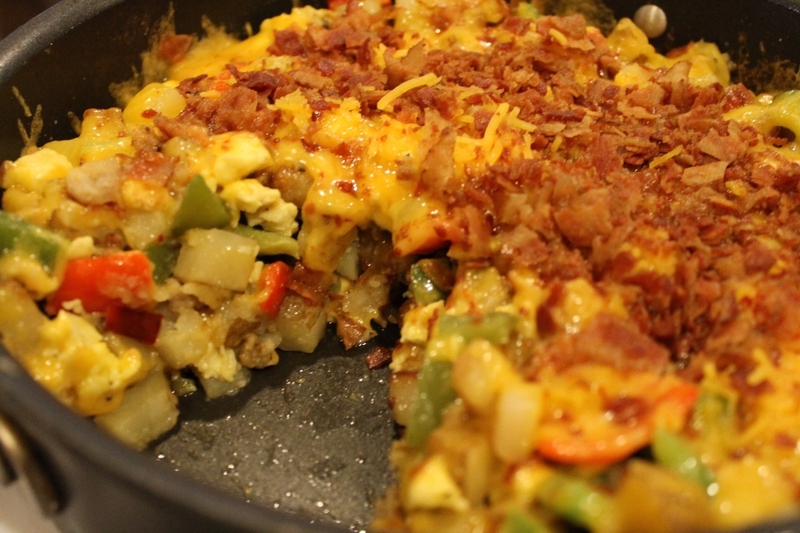 Once the cheese melts, the hash is ready to serve either on a plate or in tortillas with salsa. Next Next post: Teaching Your Kid to Ride a Bike – Could It Be This Simple?